According to Orlando Ferguson of Hot Springs, South Dakota we are not living on a globe but in a giant donut mold. 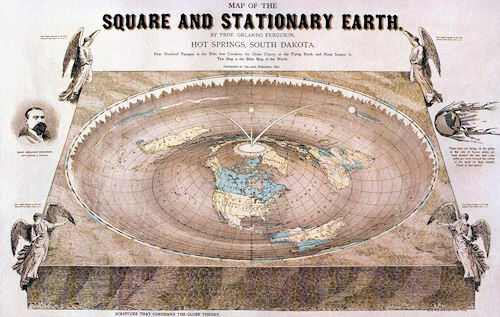 In 1893, Ferguson published his Map of the Square and Stationary Earth. It depicts the world spread over a basin with a mound in the middle. Lining the rim of the basin is the jagged coast of Antarctica, which forms the icy edge of the world. The sun and moon are depicted as rotating lamps suspended at the end of arc-shaped arms rooted in the Arctic.